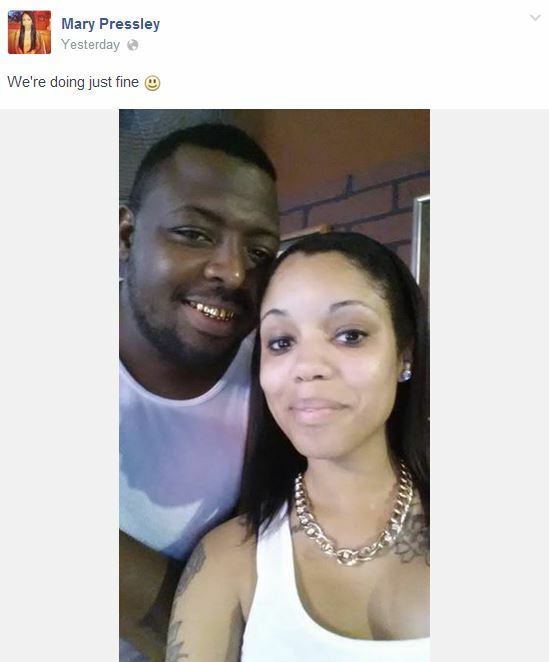 Felons Pressley and Marcus pose for a "selfie" on August 8, 2014, at 10:02 p.m., after being released from jail. 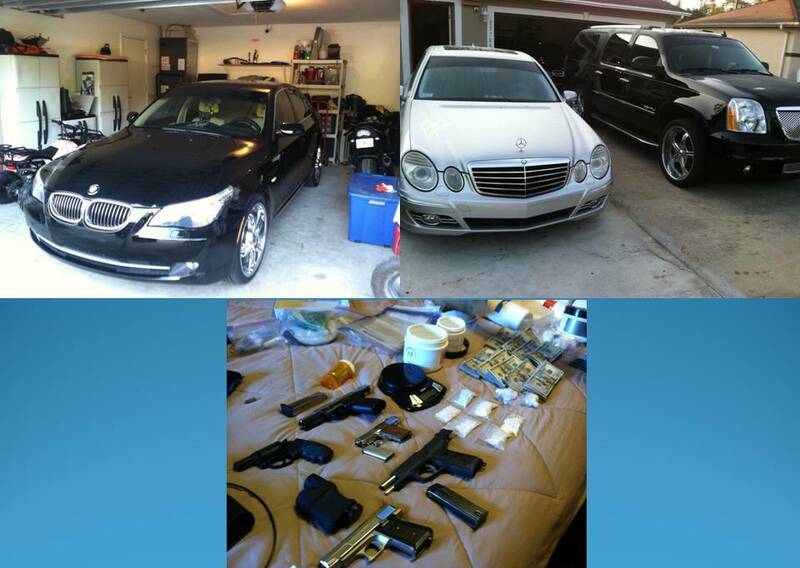 Ocala, Florida — A drug ringleader arrested in Marion Oaks yielded weapons, drugs, and a large sum of cash. 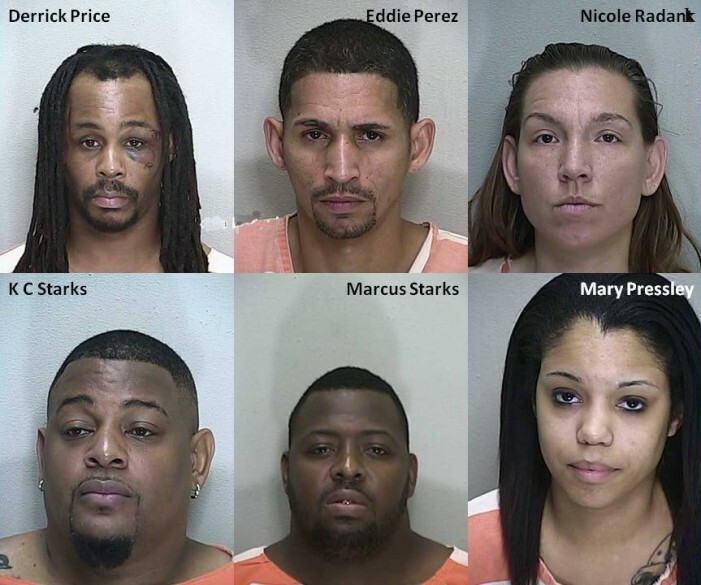 Six drug dealers, four men and two women, were arrested following an United Drug Enforcement Strike Team investigation. The Unified Drug Enforcement Strike Team initiated an investigation that spanned three (3) months. The long-term investigation culminated on Thursday, August 7, 2014, at approximately 5:50 a.m., when the UDEST, along with the assistance of the Marion County Sheriff’s Office, and Ocala Police Department SWAT Teams, executed five (5) search warrants. Agents seized 147 grams of cocaine, valued at $7,000; 815 illegally diverted pharmaceutical drugs of various types, including Oxycodone and Hydrocodone, valued at $21,000; ten (10) grams of marijuana, valued at $100; cash totaling $39,340 ; drug paraphernalia, including cocaine and pill presses, scales, and distribution packaging materials; one (1) high-powered assault weapon; ten (10) small arms handguns (various makes, models, and calibers); a cache of ammunition (various calibers); a black 2010 Nissan Maxima; a black 2008 BMW 5-Series; a black 2010 GMC Denali; a silver 2007 Mercedes E-Series; a black 2008 Kawasaki Ninja 1000 motorcycle; one (1) 2014 Triple Crown flatbed trailer; two (2) 2010 Sea-Doo jet skis; and seven (7) flat screen televisions (various models and sizes). Derrick Price, 43, of Marion Oaks was charged with Trafficking in Oxycodone (x3), Selling Cocaine (x3), Possession of Cocaine (x3), Armed Trafficking in Cocaine, Armed Trafficking in Oxycodone, Possession of a Firearm by a Convicted Felon, Possession of Methadone, Possession of Xanax, and Resisting Arrest. K.C. Starks, 42, of Marion Oaks, was charged with Selling Cocaine (x3), Possession of Cocaine (x3), Trafficking in Oxycodone, Possession of a Firearm by a Convicted Felon (x2), and Possession of Drug Paraphernalia. Marcus Starks, 35, of Marion Oaks, the brother of K.C. Starks, was charged with Trafficking in Oxycodone and Possession of Cocaine. Mary Pressley, 23, of Ocala, was charged with Trafficking in Oxycodone and Possession of Cocaine. Pressley’s name was not named in the search warrant; she was just an added bonus that happened to be present due to the fact she is in a relationship with Marcus. Eddie Perez, 36, of Marion Oaks, was charged with Selling Oxycodone(x2), Possession of Oxycodone (x2), Possession of Cocaine, Possession of Hydrocodone, Possession of Sustanon(steroids), Possession of Viagra, and Possession of Drug Paraphernalia. Nicole Radank, 33, of Ocala, was charged with Trafficking in Oxycodone, Possession of an Altered Firearm, Possession of Cocaine (x2), Selling Cocaine, Possession of Xanax, Possession of Marijuana, and Possession of Drug Paraphernalia. Marcus, Pressley, and Perez are back on the streets. Pressley, and Marcus, who is a convicted felon, pose for a “selfie” on August 8, 2014, at 10:02 p.m., after being released from jail. K.C. Starks is being held on $121,000 bond while Price is being held on $135,500 bond. Warrants were served at 13785 SW 42nd Court Road, Marion Oaks; 14310 SW 39th Court Road, Marion Oaks; 2713 SW 15th St, Ocala; 1240 SE County Road 484, Apartment E1; and 1240 SE CR 484, Apartment E2. Price, Perez, the Starks brothers, and Radank have extensive felony arrest records from other counties. The Starks brothers have been arrested multiple times in Marion County for cocaine distribution throughout Marion Oaks. A search of court records did not return any prior arrests for Pressley. Sources said the group has also been known to host illegal poker games with other associates. In addition to the thousands of dollars the dealers were making by selling drugs, they were also collecting welfare benefits. Price told investigators that he began selling drugs because he could not find a job and he needed bill money. Derrick Price was released from jail on August 9, 2014, at 5:17 a.m.